It’s National Eating Disorders Awareness Week. I has been this week every year for the last ten years I have been writing this blog. 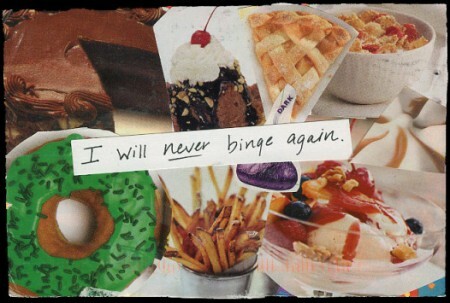 I have struggled with binge eating since I was about nine years old. I have been struggling with binge eating since I started this blog over ten years ago. You’d think that I’d be over it now. You’d think I’d have a handle on it. I think eating disorders cause permanent changes to our brain chemistry. Just like a cucumber that has turned into a pickle, you can never go back to being a cucumber ever again. Oh, and the longer you sit stewing in the brine of eating disorders, the harder it is to escape. Eating disorders feel like a disease to me. A disease that none of us can be blamed for. It’s a change in brain chemistry and there should be no shame, but I have felt an incredible amount of shame about it. 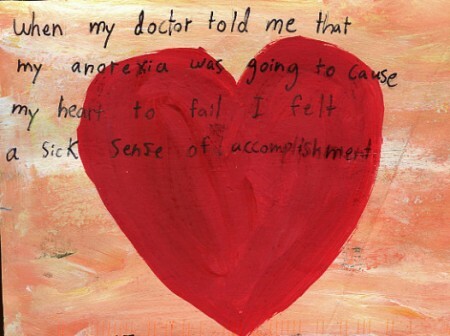 In fact, this PostSecret card reminded me of so many promises that I have made to myself. I have abstained from binge-eating for the last couple of months and I feel a lot better, but the specter of it will haunt me for the rest of my life. The biggest, scariest part of this disease for me is that if my health insurance company would find out about it, my premiums would go through the roof and I wouldn’t be able to afford insurance. So, I have never gone in for professional treatment. There ARE options out there from twelve-step programs like Overeater’s Anonymous, so if you are feeling lost, please turn to someone for help, whether it be professional or a group program. Eating disorders are just suicide in slow motion.